SoundRoots World Music & Global Culture: Togo Rocks! On Monday I was blathering on about global rock, only to recall today that there's a great new release in that genre that I have been meaning to tell you about. If you've been digging the fantastic Strut compilation Afro-Rock Vol. 1, then you should also check out some contemporary Afro-Rock. Togo-born Massama Dogo leads the group Elikeh, and while the group is based in Washington DC, its heart is clearly in West Africa. Well, most of its heart. There's clearly some Latin influence in the guitar work on "Get Ready," and then there's the French rap by Yeli Fuzzo on "Madjo" (see video below). Dogo creates original music that fuses indigenous Togolese traditional elements with contemporary elements. “Novi Nye” (My Brother), begins with the interlocking bell and drum pattern of a music known as kamou. This driving triplet-based rhythm continues as a muted guitar plays off this poly-rhythmic motif, accompanying a sanguine flute characteristic of kamou, which floats throughout the song, giving the track a refreshing lightness. As a trio of guitars produces a stir of timbres and textures, each subtly using different electronic effects, the celebratory vocals call for unity among the various ethnic and political groups within Togo. When I tell you that the group includes driving rhythms, a fantastic horn section, and social/political content you might be thinking Afrobeat. But the band is trying hard to find his own musical space outside Fela's shadow. 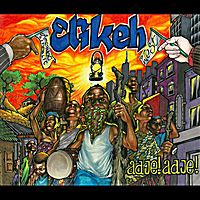 What Elikeh actually is all the time is amazing, tight, and thoroughly enjoyable. As always, I'd get more from the album if I understood the non-English sections, or if the album notes included lyrics/translations rather than just a one-line summary of each song's content. "Madjo," for example, is summarized: "I want to go back where I used to live well. Life is too hard for African's in the West." Once you hear this album, you may feel strongly about keeping Dogo together with his DC bandmates; breaking up this groove would be a shame. If you happen to be in the DC area May 27, by all means get yourself to the CD release party at the Rock 'n' Roll Hotel and convey this message in person.